This is a story about The Will of the Architect and its attempt to free itself from the hold of the seven days, each of whom hold a key that binds it. 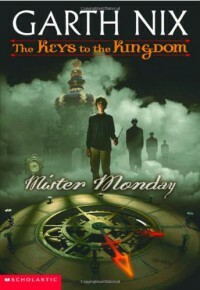 When Mister Monday attempts to exploit a loophole in the Will by giving his key to a dying Arthur, his plans are foiled because, with the help of The Will, Arthur does not succumb to his severe asthma after all. Now the keeper of the lesser key, Arthur becomes a target of Monday’s minions and his neighbourhood falls victim to a strange illness. Arthur must venture into the world of The Will to retrieve the greater key from Monday and get rid of the illness. Nix has many wonderful and unique ways of presenting magic and technology in his stories. In his [b:Abhorsen|334643|Abhorsen (Abhorsen, #3)|Garth Nix|http://d202m5krfqbpi5.cloudfront.net/books/1266527332s/334643.jpg|2339177] Trilogy, which is where I first came to know the author, necromantic powers were connected to a series of bells. [b:Shade's Children|47626|Shade's Children|Garth Nix|http://d202m5krfqbpi5.cloudfront.net/books/1347024315s/47626.jpg|411263] is technology-based, and [b:A Confusion of Princes|13458013|A Confusion of Princes|Garth Nix|http://d202m5krfqbpi5.cloudfront.net/books/1336795819s/13458013.jpg|2998126] combines technology and various psionic abilities. In The Keys to the Kingdom, magic is based on time and words have power. In fact, The Will initially appears as words magically printed in the air and the kingdom beyond is heavily focused on anything and everything to do with writing. This is all very unique, but Nix sometimes goes too far with it by making it too easy for the characters to solve problems with conveniently written in magical plot devices. The deus ex machina mentality is troubling for me as an adult, but as this is aimed at a much younger audience, I can appreciate and accept the fun results. So why did I have such trouble getting into the book? Perhaps Arthur was the problem. He’s not a particularly interesting character and his motivations are not keenly defined beyond the typical “no I don’t want to be keeper of the key” and “I’m only doing this to save my family etc.” Perhaps my problem had to do with the fact that a number of interesting characters were introduced that seemed poised to accompany Arthur on his journey, but were repeatedly left behind. Dorothy is a pretty dull character on her own. She needed her entourage for support and I think that was my problem here. Too much Arthur, too much Arthur escaping seemingly dire situations with easy magic, and not enough of the interesting supporting characters.